and plates for dozens of porcelain decorating studios that operated in Germany. marks impressed on the back. But quite a few do not. rectangular plaque, you know it was made by Hutschenreuther. 322 - 8 1/2" by 6"
324 - 8 1/2 by 5 1/2" or 8 1/4" by 5 3/4"
388 - 9" by 6"
390 - 13" by 10"
12 inches or 311 millimeters. 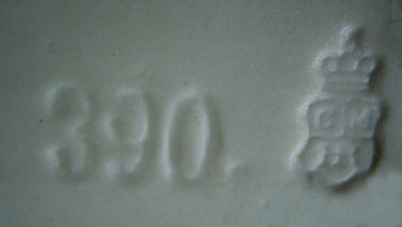 Some other numbers, such as 388 for 9" by 6" plaques, help confirm this theory. been impressed with number 254 which is the sum of their length and width in millimeters. Instead, these plaques are marked 107.
on its back, it's 100% guaranteed to be made by Hutschenreuther. number. Same purpose - size code. 15 - 3 1/2" by 2 3/4"